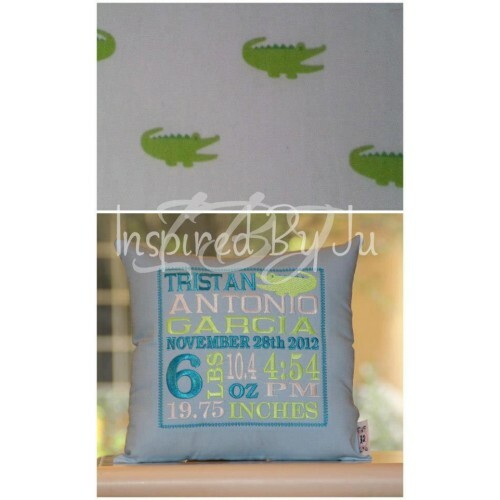 There are no better gifts/keepsakes than our one of a kind IBJ Birth Announcement Pillows. These original pillows (yes, we created and introduced them in 2011), are made with love and guaranteed to be flawless! Their quality and craftsmanship is incomparable. With over 100 designs to choose from, we are sure to make the perfect one for you! You can choose from any of the designs on our website, or we can create/design one from scratch! 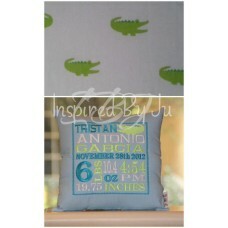 We may be able to even make one that matches a room/nursery perfectly! Please remember, these are used as decorative pillows, they are not as big as regular pillows. Looking forward to working with you! Thank you and happy shopping!! *** Please note, IBJ is NOT responsible if any of the information provided is not accurate. Please make sure that you check ALL the details thoroughly before placing the order. If there are any mistakes and changes need to be made AFTER the order has been placed, we would be more than happy to edit the design. There is a maximum of 2 EDITS at NO charge. If additional edits need to be made, there will be a $5 charge each. If the design has been approved, we are not responsible for any of the information being incorrect. It is VERY important that you verify all the information on the preview and make sure it is 100% accurate. Once pillows have been made, they cannot be changed. Keep in mind that browser and monitor settings are different on all computers, therefore the actual product may very slightly.